Located on Pike Lake Road and close to Superior Hiking Trail, Cascade River and many attractions on the North Shore. 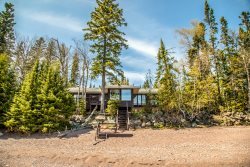 Baslager is a bright and cheerful vacation rental home located near Grand Marais, MN. Baslager has two bedrooms and 1.5 baths and can comfortably accommodate 6 guests. Enjoy this quiet, relaxing retreat where you will find yourself in a beautiful wooded setting, far away from it all. The open concept living space features a living room, dining area, kitchen, and a half bathroom on the main level. Sit back after a long day of exploring the north shore and enjoy a movie with your family. The comfortable couch is a great place to relax. The wood burning stove adds to the warm ambiance of this home. Bright windows all around this room make it a cheerful retreat. Enjoy a meal with your family at the dining room table- additional seating at the table near the kitchen. The whole living area is wide open so you can still enjoy being a part of the activity when preparing a meal. The kitchen is small but well equipped for your baking needs. Enjoy the dishwasher and not having to hand wash dishes during your vacation. Additional seating for two more guests. The half bathroom off of the living area is also shared by the water heater and well pump. Head upstairs to both bedrooms and the full bathroom. The master bedroom features a queen size bed and a full bathroom. The master bedroom is accessed off the hallway at the top of the stairs note: no door. Enjoy the queen sized bed and lovely views out of the large window. The attached full bathroom features a shower. The bathroom also has a large vanity, great for getting ready before heading out on your North Shore adventures. The guest bedroom features a twin over queen bunk bed. Another large window and a sky light make this room bright and welcoming. Enjoy the washer and dryer during your stay. Surrounded by trees, wild flowers, and peace and quiet. Baslager is the destination of choice for those who want to escape from the hustle and bustle. Located down a dirt road you are just a few miles from Grand Marais, but far enough away that you will find nothing but peace and quiet here. Enjoy being close to hiking and biking trails and several fishing lakes. Enjoy a meal outside on the picnic table on a warm summer`s evening. Once you come you may never want to leave Baslager, your North Shore home away from home. Garage is not accessible for cars, but can be used for storage. Sit on the picnic table and hear the birds chirping and squirrel scampering about just feet away. Nature abounds at Baslager. Baslager, which in Swedish means "Base Camp", is a private and peaceful home located on Pike Lake Road. This two bedroom, one and a half bathroom can accommodate up to 6 people. The open living and dining area will let you and your family spend more time together. A movie night with a wood burning fireplace will be the perfect combination for you to relax after a long day exploring the North Shore. Even better, you can watch as many movies as you want because this place has Netflix. Relax and enjoy the woods with a nice barbecue and fire. Baslager has patio furniture and a charcoal grill located in the garage and you are more than welcome to use them (they will have to be returned to their original place upon departure). If it is an adventure that you seek, consider Baslager, your "Base Camp" for your next getaway. Pike Lake is only a couple of miles away from this home. Superior Hiking Trail, Cascade River, Cascade River State Park and many other attractions can be experienced in this area. Judge C.R. Magney State Park and High Falls, located thirty minutes away, as well as the Gunflint Trail, add to the many activities. Enjoy fishing, hunting, and blueberry picking in the summer and ice fishing, snowmobiling, and snowshoeing in the winter. So many things to do and so many places to explore. This home has access to the Superior Hiking Trail, a trail from the cabin winds through the property (marked with red dots on trees) and connects to the Superior Hiking Trail just north of the "Cook County Rd 45" bridge.